TREC: Germany’s Key To MENA Energy & Water Woes Or Neo-Colonialism? Will the EU exploit the MENA region’s solar resource for mutual or singular gain? The Trans-Mediterranean Renewable Energy Cooperation (TREC) was formed in 2003 to find energy and clean water solutions for the Middle East, North Africa (known collectively as MENA), and the European Union (EU). A series of reports demonstrates that it is feasible for the “sun-belt” to provide both clean energy and water for the EU and MENA, and 50 members, including HRH Prince Hassan of Jordan, are working towards such a cooperation. But certain German and African stakeholders are weary of a potential form of neo-colonialism. Funded by the German Federal Ministry of the Environment’s Nature Conservation and Nuclear Safety (BMU) division, three reports, namely the MED-CSP, TRANS-CSP, and the AQUA-CSP published in 2005, 2006, and 2007 respectively, demonstrate that developing concentrated solar power plants (CSP) in just 0.3% of the MENA desert could provide sufficient electricity and fresh water to support both the EU and MENA. 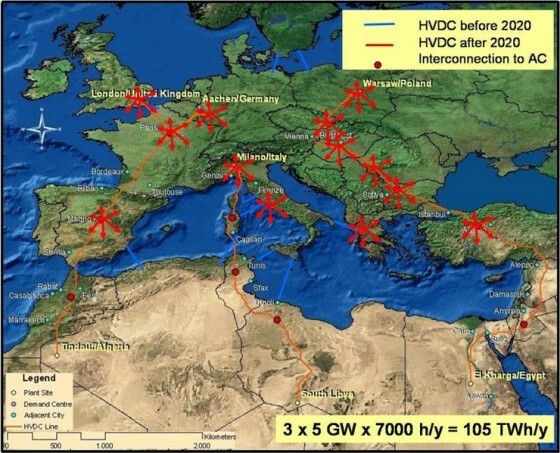 Further investigation shows that evacuating CSP and other forms of clean and renewable energy should pose no difficulty since ABB, Siemens, and Areva have long made use of the extended HVDC transmission lines necessary to create a super-linked electricity grid across the Mediterranean Sea. Participants of the 2006 World Energy Dialogue held in Hanover, Germany concluded that such a network is entirely feasible, that solar-powered desalination could solve the region’s pressing water crisis, and that trans-Mediterranean renewable energy could mitigate greenhouse gas emissions by coercing a switch away from fossil fuels. Indeed, Europe plans to spend hundreds of billions of dollars to make the TREC vision reality. But the organizations’ wikipedia page draws transparent attention to criticism of this venture. Herman Scheer, winner of the Alternative Nobel Prize, claims that the venture would be dangerous and that Germany in particular need not rely on MENA for its future electricity needs. The African Union rejects TREC as just another attempt at neo-colonialism. But Stephan Kohler from the German Energy Agency (DENA) claims that TREC is absolutely necessary. Current CSP technology is water intensive, so inroads in development are crucial in order to ensure a net-gain in water resources. Even so, the current energy climate shows great promise for alternative energy sources as nuclear energy demonstrates its ugly side, and fossil fuels are increasingly diminished. Higher volume production will lead to reduced prices and improved technology. What Africa needs is assurance that they will, for once, be beneficiaries of their own natural resources.